Review: After three years away from the limelight, Lee Gamble has resurfaced not on original home PAN - where his skewed, intense, texture-laden club tracks and experimental soundscapes made him a darling of the left-of-centre techno set - but on Hyperdub. The move is reflective of the producer's shift in emphasis. 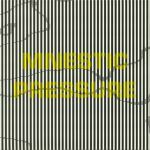 You see, Mnestic Pressure is a notably different beast to its' predecessors. For starters, Gamble has chosen to focus more on non-linear rhythms, impressively breaking up the beats whilst retaining his trademark aural textures, crackling effects and densely layered signal noise. At the same time, his alternately restless and becalmed experiments come accompanied by more melodic flourishes, making the album an unusual but hugely enjoyable listening experience.